This healthy and scrumptious low calorie recipe is a must try for snacks. Medium-Sized Red Bell Peppers- 2 nos. • Cut 4 large pita bread rounds horizontally to make thin round bread slices. • Drizzle a little oil on the sliced bread. • Sprinkle a little garlic powder on each bread round. • Spread the bread rounds on a baking tray. • Bake them at 350°C for 10 to 15 minutes, till they turn crisp. • Cool and store them in an airtight container. • Makes around 48 chips. • Deseed the bell peppers and cut them into quarters. • Cover a baking sheet with foil. • Place the peppers on the baking tray and bake them at 400°C for 15 to 20 minutes or until they are dark and blistered. • Once done, remove them from the oven and cool. • Once cool, peel the dark skin, and discard them. • Now blend the roasted pepper, sugar, tomato paste, thyme, salt, chili flakes, and garlic together in a blender until smooth. 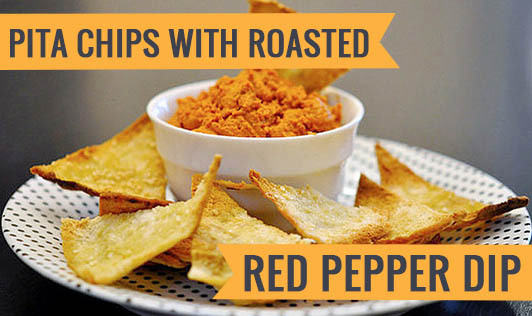 • Serve with baked pita chips.